Elephants for Elephant & Castle! Maximus have always been supportive of great causes, and are committed to a fantastic range of charities. In 2013, Maximus started a close partnership with Space for Giants, an international conservation organisation that protects the great wildlife landscapes that Africa’s remaining elephants need to thrive. Those landscapes they protect, also bring great value to the people of Africa: biodiversity, livelihoods and enterprise, new medicines, carbon storage, even the very oxygen we breathe. 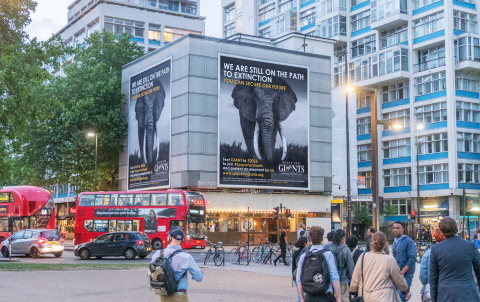 Space for Giants care about securing a future for elephants and their landscapes forever; we wanted to do our part and help them promote that incredible dedication. Given the address of this site, there seemed no better location to use for such a great cause. Giant Elephants on a Giant poster at Elephant & Castle! We very much hope the displays have the impact that they deserve. We would like to send our sincere thanks to our Landlords for generously donating the space and Southwark Council for working with us to enable planning permission to be granted for this important cause.